An asset which is held for a period of 36 months or less is a short-term capital asset. The criteria of 36 months have been reduced to 24 months in the case of Unlisted Shares, immovable property being land, building, and house property, from FY 2017-18. 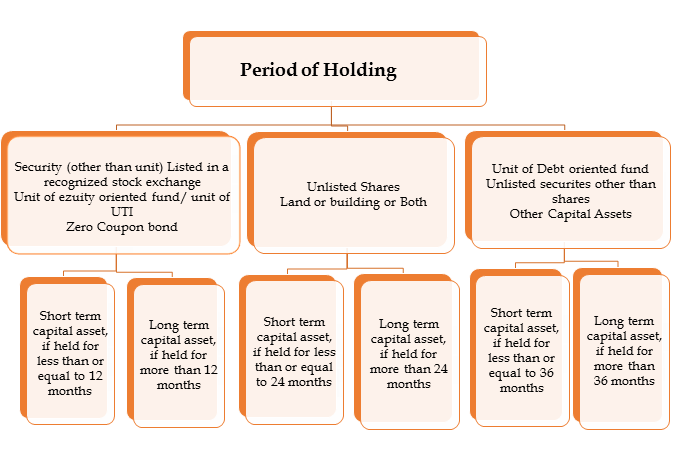 Capital Asset that is held for more than 36 months or 24 months or 12 months, as the case may be, immediately preceding the date of transfer is treated as long-term capital asset. What is meant by Capital Gains ? Capital Gains means, any profits arising from the transfer of Capital Asset affected in the previous year will be chargeable to income tax under the head ‘Capital Gains’. A capital gain may be short-term or long-term. Any securities held by a Foreign Institutional Investor which has invested in such securities in accordance with the SEBI regulations. Gold deposit bond issued under the gold deposit scheme (1999) or deposit certificates issued under the Gold Monetisation Scheme, 2015. However, jewellery, archaeological collections, drawings, paintings, sculptures, or any work of art are not treated as personal effects and, hence, are included in the definition of capital assets. ‘Property’ includes and shall be deemed to have always included any rights in or in relation to an Indian company, including rights of management or control or any other rights whatsoever. Shortest aerial distance from the local limits of a municipality or cantonment board referred to in item Population according to the last preceding census of which the relevant figures have been published before the first day of the previous year.